This Wallet from Spec Ops has no particular fancy features but offers a lot of functionality in a high quality product. 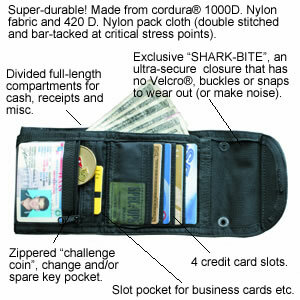 The wallet is a tri-folder with a shark-bite closure system (no velcro!) I've found this closure both soundless and secure. The main compartment offers a zipper that can be used as a hidden pocket. Then you have an internal id window, a small zippered compartment for change or some small items, four credit card slots and two unzippered small compartments for loose small items, etc. Outside you have another id window/pocket useful for Ids if you carry the wallet from a lanyard. There are 2 eyelets that can be used for a lanyard if you want to carry it from your neck or for a wallet chain if you want to secure your wallet to a belt loop. The wallet is made from Cordura Nylon, double stitched and has several reinforcement points after several months of use there are no visible marks or problems in mine even when its next to some sharp objects, keys and coins in my pocket. The Wallet is available Acu, Black, Coyote Tan, Woodland Camo, Tan, Olive and Desert Camon for $30, you can order or read more about it in Spec Ops' website. 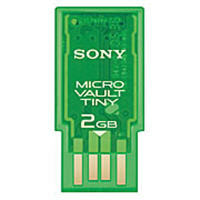 The Micro Vault Tiny from Sony is one of the smallest cutest pendrives you can get. The picture offers no size reference so I will give you a visual reference: the micro vault is about the same size as a fingenail. Amazingly this is directly plugged to any USB port and you have your storage space, there are 256MB, 512MB, 1GB and 2GB versions. The drive comes in different colors: orange, purple, yellow and blue and you get a soft carrying case that is quite cute too. The drive includes the Micro Vault Virtual Expander software that offers transparent compression when you store files in the drive, this is no better than any other compression utility but being something built-in is a nice thing. The 2Gb version retails for about $80, prices of pendrives fluctuate a lot so check your favourite dealers. More information in Sony's website. 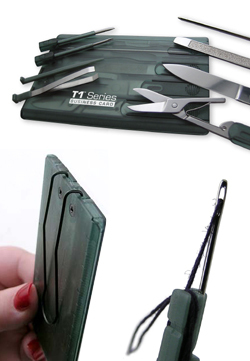 The T1 is a credit card sized multi-tool from Tool Logic primary intended for the every day business man. The tool offers a small blade slash letter opener, ballpoint pen, nail file with cuticle tool, scissors, tweezers, toothpick, small phillips and flat screwdrivers, a sewing needle,a ruler and a pocket clip that can be used as a money clip as well. The combination of tools is fine, a small pin would have been more practical than the sewing needle, the tools in general are ok, not spectacular but do their job. The plastic tweezers are the weakest link. The T1 is quite complete, maybe more oriented to personal care rather than "business". The best is probably the clip, since you can use this as a money clip and have a useful set of tools at the same time and if you don't want the clip it can be removed so you can store the tool in your wallet. The T1 costs about $15 and you can read more information in Tool Logic's website. 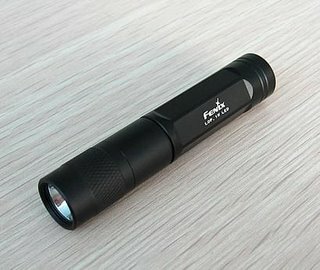 The Fenix L0P is the AAA keychain flashlight in the Fenix series, in some way a direct competitor of the venerable ArcAAA. Instead of a Nichia 5mm led as in the Arc the L0P uses a 1 watt Luxeon lead and therefore it is much brighter. The biggest problem of the original L0P was its short runtime, the light was bright but the runtime around 30 minutes or less required the use of rechargeable AAA batteries and a lot of maintenance and that might be a problem in a keychain light. The special edition of the L0P has 3 brightness levels, you can change levels turning the light off and then quickly on, if you leave the light off for 1.5 seconds the next time you turn it off you return to the primary level. This interface is not fantastic but in a flashlight with just a twisty switch there are no better alternatives. The 3 brightness levesl solve the runtime problem allowing long runtimes in a lower level keeping the brightest level in case of need. The flashlight is well built in solid aircraft grade anodized aluminium with an UCL lens. It comes in a box with a splitring and a claw-style clip. It's a close call between this light and the ARC AAA-p it depends on your taste, needs and judgement. The price is $39 and you can get it from Fenix Store. The Object XL is a telescoping pen by Tombow. The pen measures 4'' when closed and 5'' when opened the mechanism is a simple push to close/pull to open. The ObjectXL uses a pressurized ink refill, this mean that as the Fisher space pen products, the Tombow can write upside down, in wet surfaces, waxy paper, etc. There are two color options, black as in the picture or silver both in metal finish. The metal finish will definitively wear down if you use it in your pockets or keychain. There is no pocket clip but you have a hole for a lanyard or splitring, to my taste the pen is too big for a keychain so I would have liked a clip. The retail price is $24 you can get it for Penwa.com or other dealers.